Modern actuators are increasingly equipped with functions that provide information to the process operator, closing the loop with feedback that confirms the valve position, suitability of the energy supply to the actuator, and a range of other specialized data points. A continuous goal for any plant is is a reduction in whatever level of maintenance that is currently required to keep everything operating. Maintenance is costly and time consuming, a set of many specialized tasks, each with a probability of not being completed properly. Industrial process control encompasses a broad range of fluid handling operations. A significant part of fluid control is accomplished by valves, many of which are operated automatically through the use of actuators. Actuators are mounted on valves in place of, or in addition to, a hand-wheel, lever, or other manual means of opening and closing the valve. With an actuator installed, a control signal can be transmitted from a remote source to the actuator, commanding a change in valve position, and the actuator will respond by converting some form of connected energy into mechanical motion that positions the valve accordingly. 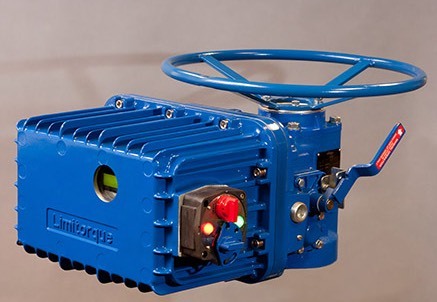 The Flowserve Limitorque L120 electric actuator pictured above is designed for a wide range of environmental applications in power, oil & gas, and water industries. Visit Swanson Flo at www.swansonflo.com or call 800-288-7926 to find out more about Limitorque and discuss your potential applications. Swanson Flo's Illinois Sales Office linecard.